Sri Lanka's ex-president to visit Seokwang Temple in Korea. August. 09, 2016 06:43. . The Seokwang Buddhist Temple in Bucheon City, Gyeonggi Province is holding the third July 7th and Baekjung (Buddhist All Soul's Day) Culture Festival from Aug. 9 through Aug. 17, in which visitors can gain holy witness of the Buddha’s sarira. Sri Lanka's former President Mahinda Rajapaksa will attend the worship ritual at 9:30 a.m. on Tuesday, adding to the significance of the event. 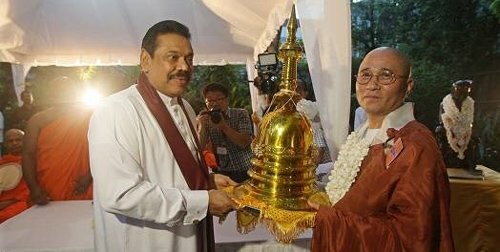 During his presidency, Rajapaksa donated Buddha’s sarira from the ancient Ruhunu Dynasty in July 2014. The Seokwang Temple has been maintaining relations with Sri Lanka since 1995 by contributing to the welfare of Sri Lankan migrant workers in Korea. The temple has also supported projects for education and culture in the South Asian country through some organizations such as the Bucheon Foreign Migrant Workers’ House and the non-profit organization White Elephant. The holy witness session will take place after a 108 prostrations session at 1 p.m. from Wednesday to Tuesday next week. Rev. Gosan, the chief of the Ssanggye Chongrim Temple, will preach Buddhist teachings at 9:30 on Wednesday. The Seokwang Buddhist Temple in Bucheon City, Gyeonggi Province is holding the third July 7th and Baekjung (Buddhist All Soul's Day) Culture Festival from Aug. 9 through Aug. 17, in which visitors can gain holy witness of the Buddha’s sarira.